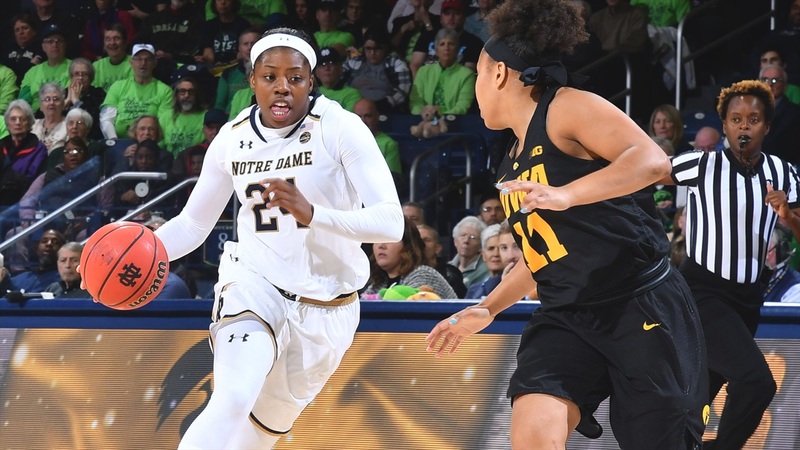 ENotre Dame returned home to Purcell Pavilion and played its best offensive game of the season with a devastating third quarter performance that broke the game against #14 Iowa wide open. 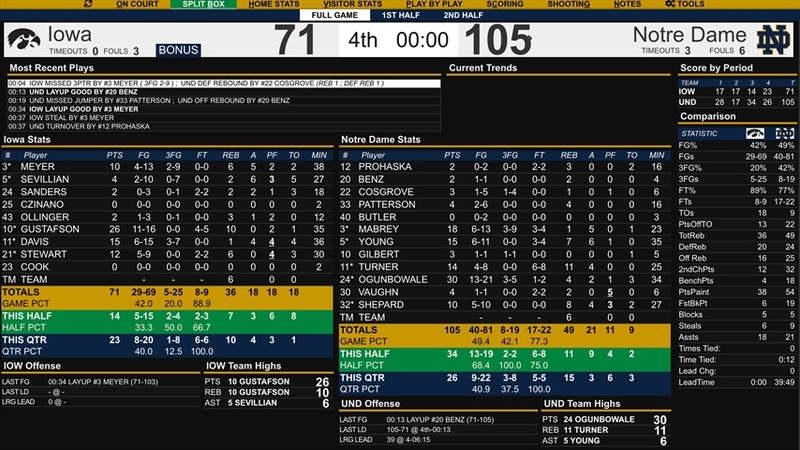 After taking an eleven point lead at halftime, the Irish started the third quarter on a 12-0 run and outscored the Hawkeyes 20-3 in building a 28 point lead before Iowa scored its second field goal of the quarter. Notre Dame scored 34 points in the third quarter to 14 for Iowa. The Irish made 13 of 19 field goal attempts (68.4%) including a perfect 2 for 2 from three. ND limited Iowa to 5 for 15 from the field (33.3%) and forced 8 Iowa turnovers. Arike Ogunbowale scored 12 of her game-high 30 points in the third quarter and made 5 of 6 field goals including making both of her three-point attempts. Coming into this game, Ogunbowale was only shooting 42% from the field and just 28.6% from beyond the arc. She made 13 of her 21 field goal attempts (61.9%) including 3 for 5 (60%) from deep. Notre Dame’s other four starters all scored in double figures. Marina Mabrey added 18 points in just 23 minutes on the floor. Mabrey started the scoring in the first seven seconds of the game by making a three-point shot to give the Irish a 3-0 lead — a lead they would never relinquish. Mabrey had 5 assists against just one turnover and made two steals. She added a second three before the game was two minutes old. Brianna Turner played another solid all-around game — 14 points, 11 rebounds, 4 assists, 0 turnovers and 1 block. She made 6 of her 8 free throw attempts. Jessica Shepard scored 10 points with 8 rebounds, 4 assists and 2 steals. Jackie Young had 15 points, 7 rebounds, 6 assists, 2 steals and 0 turnovers. After the game, Coach Muffet McGraw was happy with the overall effort, but especially with 21 assists to just 9 turnovers for the night. Iowa’s leading scorer, Megan Gustafson, had another sparkling performance for the Hawkeyes scoring 26 points and grabbing 10 rebounds. After Gustafson went 6 for 6 from the field in the first half, the Irish limited her to just 1 for 4 in the pivotal third quarter. For the game, she was 11 for 16 from the floor (68.8%), which was below her 77% shooting over the Hawkeyes first five games. The Notre Dame defense did limit Iowa to just 5 of 25 from three. Meanwhile, the Irish hit a season-high 8 three-point shots. Notre Dame came into the game averaging just 2.8 made threes for the season. However, since Marina Mabrey has returned to the line-up, the Irish have made 14 threes over the past two games. Mabrey’s return to the starting line-up seemed to help Ogunbowale. Without her roommate and best friend on the court, Arike struggled at times in the opening quarter as she tried to jump-start the offense. 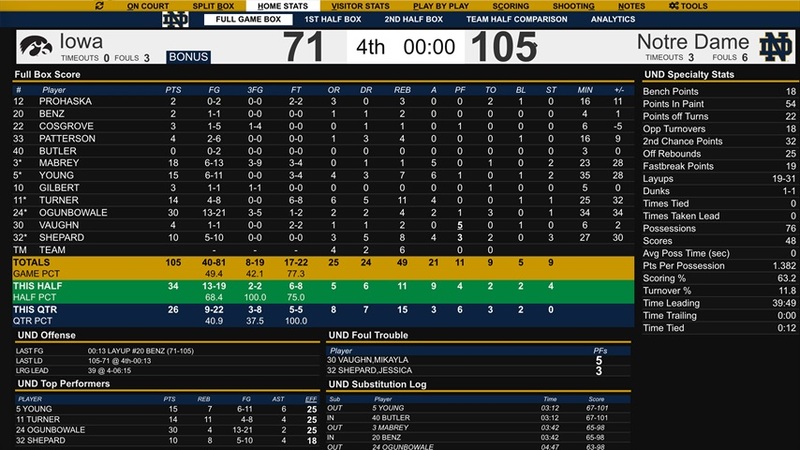 After Marina drained two three-pointers in the game’s first two minutes, Arike was able to let the game come to her, and all of her shots were under control and in rhythm. Tonight’s win moves the Irish to 7-0 on the season and sets up Sunday’s anticipated rematch with #2 UConn. The Huskies roared by DePaul Wednesday night 99 to 63 to move to 6-0. Sunday’s game is scheduled for 4:00 pm (eastern) tip-off on ESPN.